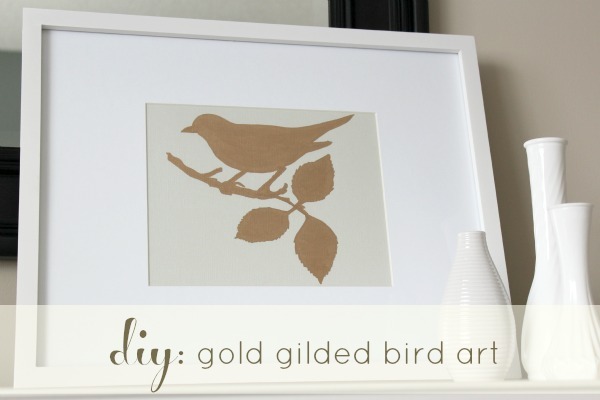 This gold gilded bird art was easy and inexpensive to make. 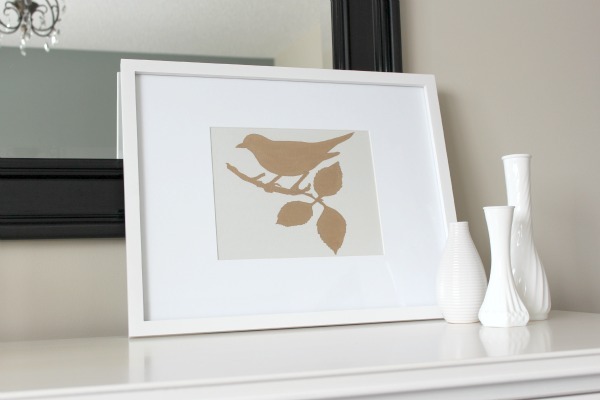 A simple and beautiful DIY art project to dress up any space in your home! I was really impressed with the fabric paint projects the gals came up with last week, and I’m certain this round of the One Item Project Challenge will be no different. If you missed the introduction to this series and want to be brought up to speed, you can check it out the details and previous projects HERE. This time I chose gold gilding or leafing as the supply. I’ve been wanting to introduce a bit of gold into our home for a while now, and thought this was the perfect opportunity. 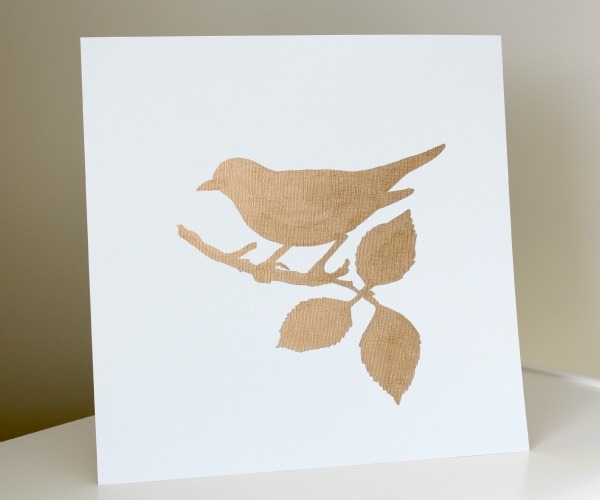 After working with silver leafing in the past, I thought it would be fun to give something new a try, so I picked up Martha Stewart’s liquid gilding on one of my trips to Michaels. After pondering what I could do with it for a couple weeks, I remembered a beautiful bird tray I saw at Pier 1 Imports in the spring, and decided to use it as a source of inspiration for an art project. Next, I shook the gilding bottle really well, dipped the larger paint brush into the gold, and began to fill in the drawing, starting with the bird, working down, and then left to right on the branch. I switched between the very fine brush and larger angled brush as needed. After the first coat dried for an hour or so, I went back and touched up the fine detail areas, making sure everything was covered. 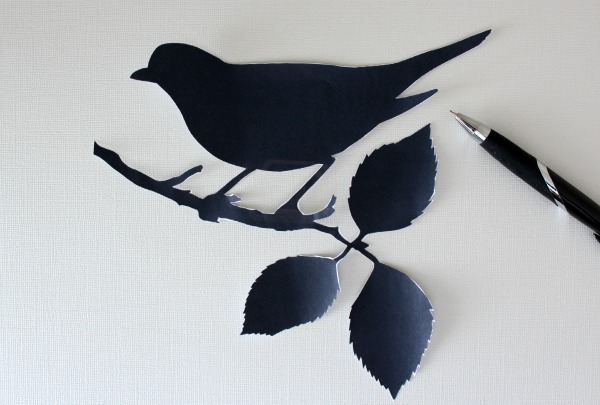 I also used the smaller brush to give the bird and leaves a little definition. To finish it off, I used an inexpensive frame I found at a big box store. I like how the white keeps it looking fresh. 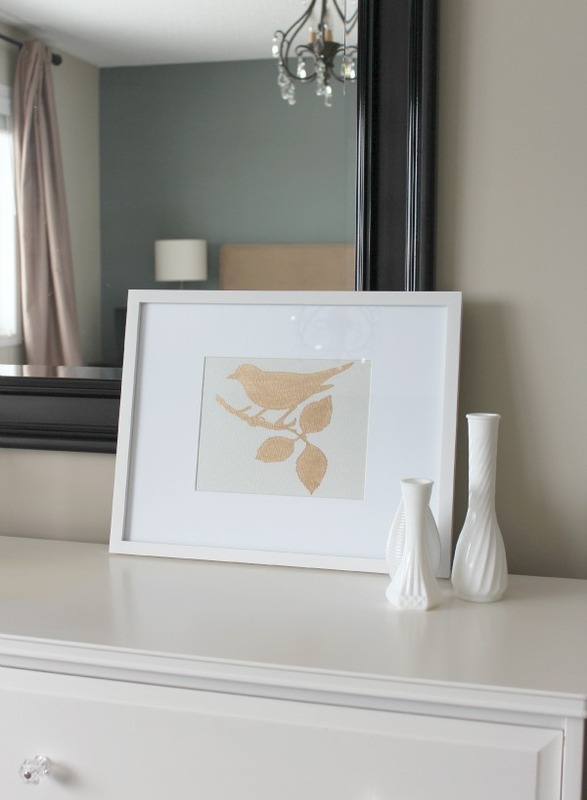 I leaned the bird art on our bedroom dresser against a hanging mirror for now, but I’d like to create one more piece so I can hang them above our nightstands on either side. I love how the light bounces off the gold and adds a subtle touch of sparkle. Be sure to come back next Wednesday to find out what the final craft supply was on our One Item Project Challenge list and see what we all did with it. Oh, and there’s also a fantastic giveaway you won’t want to miss (hint: it’s the related to today’s craft item)! Update- See that post HERE. 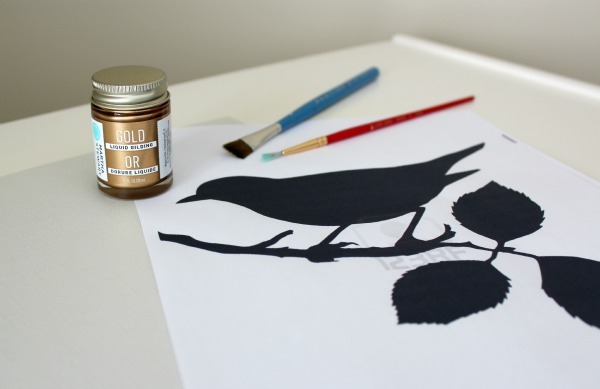 For more ideas similar to this one, check out the Craft Gallery! I was a little cautious adding gold to our space (after living through the 80’s), but I really like the shade of gilding I used and think it adds shimmer without being too much. Thanks again for partaking- your project looks great! You should do it. The site where I found my bird graphic has a whole whack of bird images, but you could basically do whatever you like. I’m so glad you’re partaking. Enjoy your day! Beautiful! What a great way to bring gold into a space. I always tend to think frames or little accent pieces, I never would have thought of artwork. You did a really great job! Thanks Alli. It was pretty simple to do! This is very pretty! I love how clean and simple it is. Thanks Angelica. So glad you’re following! That is so pretty Shauna. I’ve never used the gilding before. I’m definitely going to have to think of something to make with it. That looks great! It’s really pretty, so crisp, clean, and simple. Fabulous! Beautiful! I love it! Thanks for adding the links to the other gold projects. I will check them out.